This topic describes how to set up or change a refresh schedule for extract data sources you keep fresh using a Tableau Bridge client. Tableau Bridge refresh schedules can complete successfully only if you embed your database credentials in the connection in Tableau Bridge. For more information, see Embed or update database credentials. When you schedule a refresh in Tableau Bridge, the time of day that appears there and on the Tableau Online schedule list reflects the time zone of the computer on which you are running Tableau Bridge. You can set up a Tableau Bridge schedule as you publish your extract data source to Tableau Online. While you are signed in to Tableau Online from Tableau Desktop, select Server > Publish Data Source to publish your extract data source to Tableau Online. Use the Publish Data Source to Tableau Online dialog box to configure options for your data source, and click the Publish button. This opens a browser window to Tableau Online. In the Publishing Complete dialog box, click the Schedule Using Tableau Bridge button. In the schedule dialog box, choose a client and set the new schedule. Choose the refresh client: From the Start Tableau Bridge on drop-down menu, select the computer associated with the Tableau Bridge client that you want to use to refresh the extract data source. To refresh at a specific time on selected days: Select Daily, select the days of the week, and then select the time of day from the drop-down lists. Note: To optimize performance on the server, refresh tasks are distributed within a range of up to five minutes of the time of day you specify. For example, if you set an hourly schedule, the occurrence set to run at 1:00 AM could run any time between 1:00 and 1:05 AM. Specify full or incremental refresh: If available, specify whether you want a full or incremental refresh. By default, Tableau Online runs a full refresh. Incremental refresh is available only if you configured it in Tableau Desktop before publishing the extract. For information, see Refreshing Extracts in the Tableau Help. Click the Set Schedule button. You can set up a Tableau Bridge schedule after you have published the data source using Tableau Online. Sign in to Tableau Online and navigate to the All Data Sources page. Click the name of the data source that you want create or modify its Tableau Bridge refresh schedule and click the Extract Refreshes tab. On the right-side of the page, make sure that the correct Tableau Bridge client is listed next to Refresh this extract on. To create a Tableau Bridge refresh schedule, click the New Extract Refresh button. To change an existing Tableau Bridge refresh schedule, select the check box next to the schedule, and then select Actions > Change Refresh Schedule. In the schedule dialog box, set the schedule. Click Schedule Refresh or Change Schedule. You can also use the Tableau Bridge client to create or change a Tableau Bridge refresh schedule after publishing the data source to Tableau Online. While you are signed in to client, open it by selecting its icon in the system tray. Point to the data source you want to schedule, and then click the Schedule icon. This opens a browser window to the Refresh Schedule page in your Tableau Online account. To create a new schedule, click New Extract Refresh. 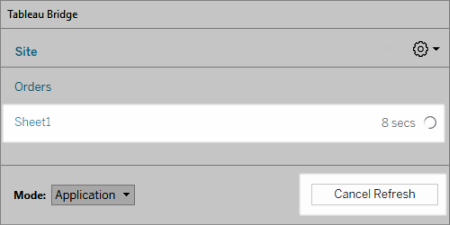 To change an existing Tableau Bridge refresh schedule, select the check box next to the schedule, and then from the Actions drop-down list, select Change Refresh Schedule. In the schedule dialog box, set the new schedule. In some cases, you might need to cancel an in-progress extract refresh of a data source managed by Tableau Bridge. To do this, follow the procedure described below. While you are signed in to Tableau Bridge client, open it by selecting its icon in the system tray. Click the Cancel Refresh button. This action will cancel the active extract refresh. Note: A client can perform one extract refresh at a time. If you need to refresh more than one extract at the same time, consider setting up additional clients on different computers to perform the extract refreshes. Open Tableau Bridge client from the Windows system tray on your computer. In the list of data sources, select the one for which you want to view the refresh times. The client shows the last actual updated time and next scheduled update time.